What's a dungeon without its loot ? 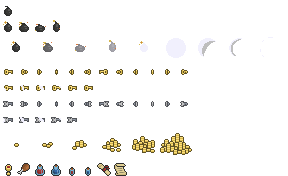 This sprite sheet has bombs, keys, gold, food, potions and scrolls! 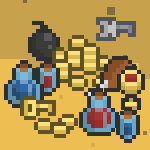 Explosion animation and gold is 32x32 pixels, all others are 16x16. WOW! Very good. Can you remove the background for me, please? You do realize you need to download the sprite sheet down below the info right ? Just click on : " Dungeon Collectables.png 24.2 Kb" and you are good to go.